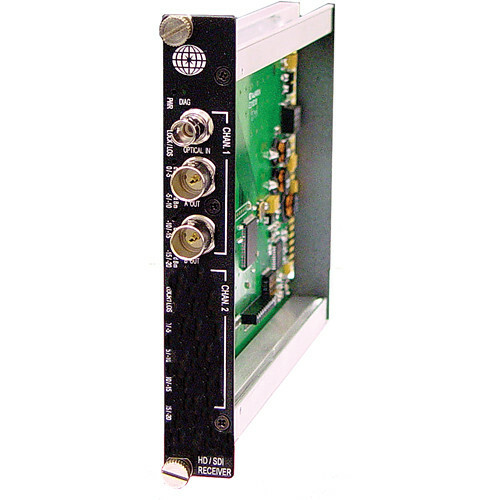 The SR-1HG-1 Fiber Transmission System (Receiver) from Meridian Technologies supports one channel of SMPTE 292M, 310M, 259M, 344M and 424M compliant digital video one fiber. This model uses multimode fiber. It is well-suited for use in remote broadcast camera links, sporting events, media feed, video production, and information displays, among many other possible applications and settings. It supports the real-time transmission of video without compression. Reclocking supports retiming, reshaping, and regenerate functions. No user adjustments are required to use this device. The DigiView product family is available as rackmount cards and modules that can be installed in any Meridian's desk chassis or stand chassis, as well as in 3U, 19" racking frames. Nominal Level: 0.8Vp-p, 1.0Vp-p max. Box Dimensions (LxWxH) 10.0 x 7.0 x 3.0"